This morning we work with the energy of the Holy Spirit, which comes through the aspect of the 3rd ray. We work with the Archangel Chamuel who, when called upon, helps to align us to Soul and Spirit and the Lady Charity who brings the energy of forgiving love. So what is Holy Spirit and how do we experience it? The Holy Spirit can manifest in different ways according to people’s varying beliefs. It is the 3rd part of the Trinity which the Bible quotes as the Father/Son and Holy Ghost or Holy Spirit. Its down pouring into our lives brings the 9 gifts of the Holy Spirit which are discrimination, fortitude, faith, knowledge, wisdom, healing, understanding, prophecy, speaking and the interpretation of tongues and the working of miracles. It is the very nature, presence and expression of that highest spiritual power, actively working in us whom we call God or whatever name you give to your highest concept of Love and Light. When overshadowing the Lady Mary and Jesus, the Holy Spirit manifested as a gloriously illuminated angelic being and as such has also been seen by others at different times in history. For me personally, my experience with the down pouring of Holy Spirit has occurred on three separate occasions in my life, when I received wave after wave of incredible peace followed by a joy so intense, it was almost unbearable. In healing The Holy Spirit brings harmony to all the bodies, comforts, nurtures and to those giving and receiving this beautiful energy, it brings a more youthful look because it rejuvenates the cells of the physical body. It is a beautiful light to work with. We are on the threshold of rebirth for both humanity and the earth, we are being raised to a higher vibration, a higher consciousness, and as we have chosen to be born into the events of this time, we share the pangs of the earth’s rebirth. We enter into a new partnership in which the whole life forces are changed into another relationship with the energies of stars, planets, suns and moons, both visible and invisible, and these become a living part of the cells of our bodies. 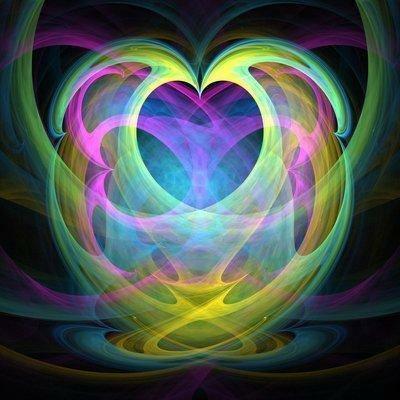 Our nervous systems, our loves, our hearts and our very movements are stirred afresh with a new vibration. Souls both young and old enter into a new world, a new age and as we do, struggle with these vibrationary changes taking place around and within us. We must learn to live in harmony with each other, to be patient with what we conceive as ignorance, selfishness, greed and other negative aspects of our own and others personalities. We must learn to live in harmony with nature and the elements. We must let sickness, pain and illness flow away as new areas of health in spiritual awareness take place, allowing us to move forward into this exciting age of Light when all things will vibrate with new music, new feelings and new ventures. Let us then give of what life we have left within our earthly incarnations, our dedication, optimism and courage to ignite the fires of change within ourselves and that consciousness of tomorrow will be worthy of the sacrifices of today.